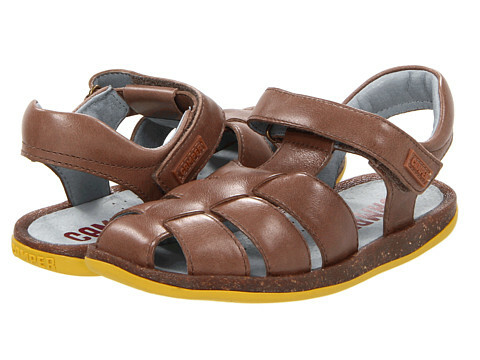 I think that these are a great, slightly less-stuffy take on a boys' fisherman sandal. Camper Kids shoes are well-made and comfortable, though usually super expensive. However, these style 80177 sandals with the great yellow sole are on sale at 6pm right now for the best prices I have seen around. They are available in toddler through youth sizes and the price ranges from $37 to $41 dollars instead of $70 to $90. Plus, shipping is free for all orders from 6pm. This is a great solution for summer; sandals that are comfortable enough to wear daily but also look good with dressy shorts and a button-down when the occasion requires it. 6pm was sold out of the size I needed in these, but I am crossing my fingers that they will have yours in stock.